We have chickens. Some might say we have a lot of chickens. Right now, we have 48 chickens. No joke. 17 hens (egg-producing aged chickens, well one’s a rooster). 18 “toddlers” (mostly pullets: pre-egg-laying aged chickens, but some will be roosters) and 13 baby chicks (all future egg layers). What are we going to do with all these chickens?!?!? Answer: Put them to work! Here they are tilling and fertilizing the floor of the new greenhouse before we closed it up. We have been super busy around here gearing up for the county we live in to launch it’s first legit farmer’s market. In order to sell anything, we have to have proper licensure and things all in order. In the next few weeks, you might see some changes around here and we get with the program and get “branded” and launch our product line! Really exciting stuff and progress. So yea, back to the chickens. 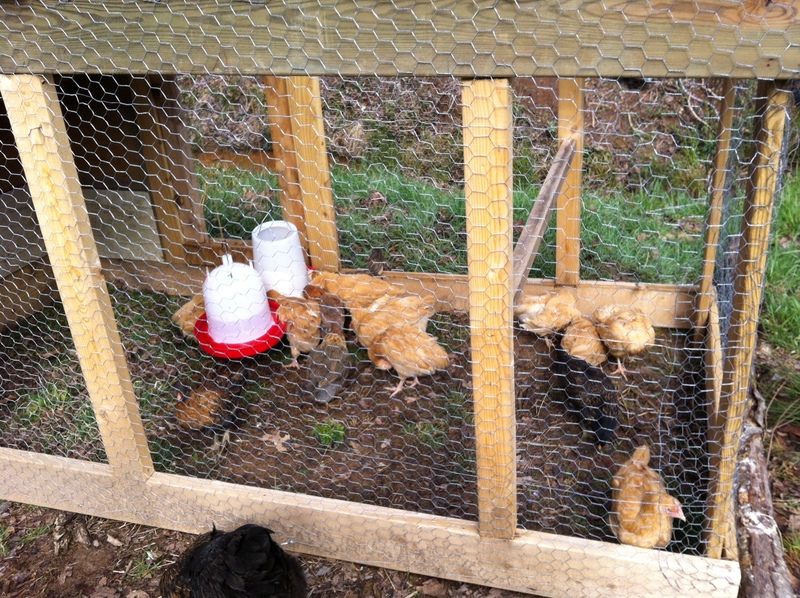 We will be selling free-range, pastured eggs. We currently sell eggs to a few loyal customers, but are so excited to branch out and be part of our local agro-community. We have already enjoyed meeting some new people and have learned so much in this process, from how to think and talk about our vision and what Callywood Farms really stands for to all the state’s laws and policies for selling eggs. Our plan right now is to be able to offer eggs. We will be adding about half of the new chicks to the existing egg laying flock. Farmer B has designed and built a great chicken tractor. It’s very simple. For those that aren’t familiar with a chicken tractor, the idea is that the chickens are placed in a moveable caged area. 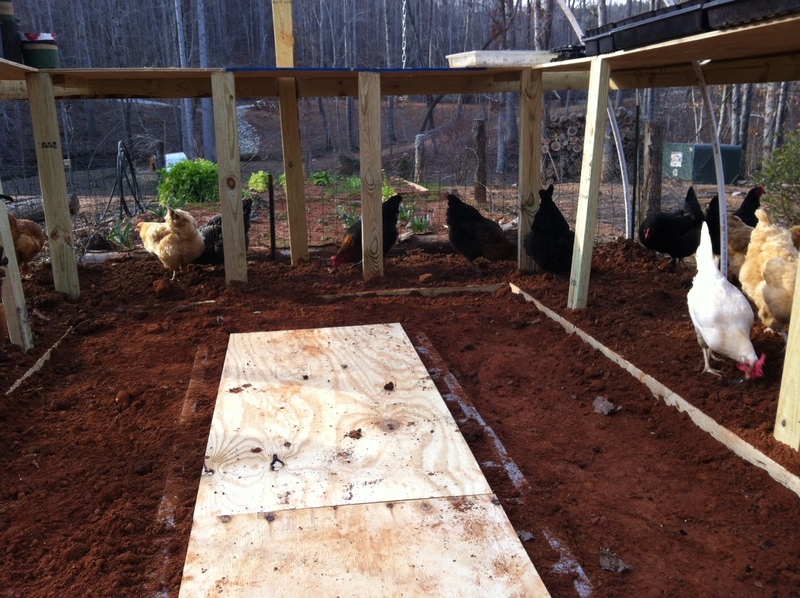 The “tractor” is then placed out in the pasture for the chickens to graze and eat in a certain area. Once the chickens have mowed that spot (and left behind all their wonderful…er…crap) then you just move the tractor to the next spot (it’s on wheels). These chickens will exclusively live in the tractor. Once they are about 4 months old and full grown and looking good, well then, it’s time for harvesting or moving into the chicken palace to become an egg-layer. We plan to harvest all of the chickens destined for our dinner table ourselves this year. We are hoping for a total of 22-26 layers, which leaves a good 10 for dinner. This is all a trial run. If all goes well, we hope to have a couple more tractors built and next year, we might be able to offer free-range, pastured chickens on the market too. We will also be able to offer any vegetables from the farm at our stand, however, we are still figuring all that out and not sure how much excess we will really have to sell. Wish us luck at our first farmer’s market this weekend! This entry was posted in Chickens, farm by callywoodfarms. Bookmark the permalink. Love the updates and I hope you hear our rabble-rousing cheers of encouragement all the way from Colorado. Love the Calllywood vision and can’t wait to hear more. Keep it up you guys! Ah, I forgot to link up last week. I will this week! I hope your market went well. Are you participating as a seller or buyer?